Solid milk chocolate cigars from Madelaine, molded 3/4 oz. 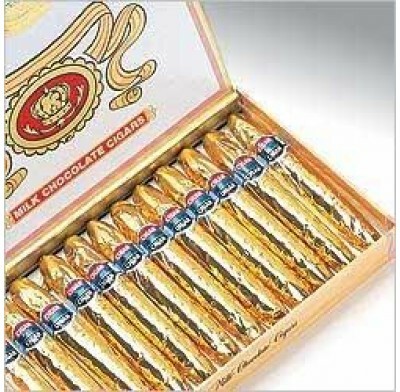 cigars, wrapped in gold foil with the traditional band printed around the cigar. Comes in a unique and realistic cigar box. Much sweeter and healthier than the real thing! Kosher Dairy. Boxed candy comes 24 cigars per box.